Sorry - I don't know. I just searched on YouTube for anything with "Otter Hole". I don't recall it being dangerous, you just have to time your entry/exit by the tides, or your trip could be rather longer than planned. Hi Amy, the cave "Otter Hole" has a leader system (plus access for the local clubs) Season usually runs from April to Oct, shouldn`t be a problem to either find a booked club trip you can beg a place on or organise a trip through one of the local clubs (Gloucester SS, Royal Forest of Dean CC or Hades CC) PM Me nearer the time of your visit. I figured it might have a leader system for something like that. Thanks for that, Amy. We do get a lot of stick sometimes from people who believe that gating any cave is somehow a denial of their human rights. It's nice to get an outsider's perception of this, sometimes. No problem You are all so friendly and such it's not an issue getting access - I mean, you trusted a total stranger and non-UKian (aka me) in your caves so Im not sure what their fuss was about. Complainers will complain, I guess. Here, we get stick from people who don't like it that cave surveys and directions are not public access - but keeping those secret knowledge within grottos and with trusted cavers is the only way really we have to control access since we don't have gates, or leader systems, or anything like that as standard. And in general, we're the same way as you in that regard - join or even just hook up with a grotto and you'll get to go on trips with them and if you don't ruin things or make trouble, you'll get in on where all the stuff is too, no troubles. Most grottos aren't some "secret elite society" - there are a few that have their pious issues but those are the exception. Some caves here get gated - usually ones that conservancies have been able to acquire and deem it necessary, but that's not very many in the grand schemed of things. 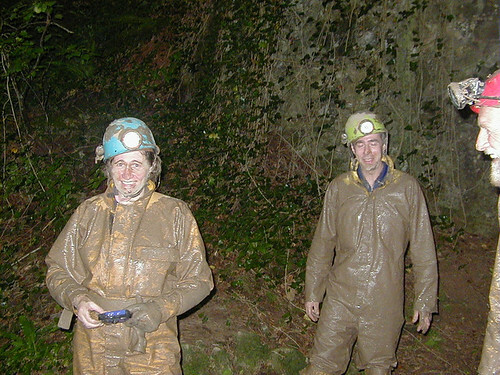 My only experience of caving in the US was in West Virginia, where access varied from completely open (My Cave) to hidden behind a tree in Carroll Bassett's garden (The Borehole). My favourite "gate" was the house that has been built over the entrance to Scot Hollow. LOL that is awesome. I want a cave in my basement! I've not been caving in WV at all yet. I have some contacts...including one former WV caver who now lives near me in Michigan and he sometimes goes back out there so maybe sometime I will. In the next bit most of my caving will be with the St. Joseph Valley Grotto in Indiana and Kentucky. Also...just doing my income taxes...looks like the gov't owes me yet again (woot!) so this means....if I can set aside the money and not need it then indeed, it's looking pretty good to get back over there later this year I think my TAG friend might be traveling around on that side of the world at some point so maybe we can meet up then in UK for some cavetimes!